Truth is the railroad town on one side of the river, in the United States; Bright Water is the reserve on the other side of the river, in Canada. Once there had been a plan to build a bridge, but something went awry. What remains is barely recognizable, and even if the components had once been solid, they, too, are now ruined. Thomas King does not shy away from talk of devastation and loss, fractured promises and decay. In Truth and Bright Water, hearts are broken and people disappear. A reader might even say that the narrative is framed by tragedies. But a reader would also have to say that the tragedies do not stand alone. In the hands of another writer, this might have an air of a conscious balancing act. But in Thomas King’s narrative, it feels as though there is something larger that acts as a counterweight, not a specific narrative device, but an overarching sense of grace. It’s rough: shadows, deserted, rusting webs. But there is the sky. It’s nasty: pitted, stripped, open wound, scabbed, blistered, split. But it’s curled up in twists like pigs’ tails. It’s dynamic, it’s alive. Perhaps, in only a sentence or two, this cannot be adequately experienced. But the cumulative effect of reading this narrative voice takes hold of the reader in a unique way. Thomas King is, unquestionably, a story teller. By the end of the first chapter, I wasn’t too keen on Tecumseh or Lum or the Dog Soldier. But there was no question about whether I would keep reading. I was caught. Yup, Thomas King, like Tecumseh’s father, knows how to tell a story. And there are very funny bits. Some of them get funnier, still, after they’ve happened. When they’re referred to, later in the narrative. Out of the context of the story, I wouldn’t find them funny. But Thomas King has convinced me, thoroughly, that they are funny, from the perspective of those who are actually experiencing them. The only thing that matters is what seems overwhelmingly real, which is the world on the pages of Truth and Bright Water. When I try to enumerate the ways by which this book has won my heart, I hesitate. There are some specifics that have pulled me in. The relationship between Tecumseh and his mother is remarkably well-drawn and his friendship with Lum is credible and memorable. And I absolutely love the way that he talks to Soldier. But the way in which it has most thoroughly engaged me is not about specific elements. It’s that feeling that I’ve had some trouble describing. That sense of something larger. That sense of being pulled into it through the simple act of reading. My reader’s existence nearly unrecognizable through the lines of text, as though the author has pulled me into the ink and paper, tugged me in there amongst the lines of text, added a layer of shellac to keep me there. I had the same feeling when I read Green Grass, Running Water. And I don’t think I explained it clearly then either. Maybe this is when I should just shrug my reader’s shoulders and call it magic? Thanks, Gavin: I’m glad that I’m not the only one struggling for the right words there. And oh, my, that painting is something else. So many ways to interpret that! Agreed that he is charming in person, Carolyn. I heard him read from his short story collection a few years back and it was as though the walls of the theatre snugged in as he spoke: a warm and nourishing feeling. Though I imagine that a speech would be even more amazing to hear: how lucky you could attend that! 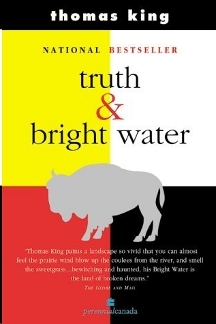 Thomas King spoke at my university in Lethbridge a few years ago and he was wonderful, so engaging and funny and warm. I’ve never read one of his books, but have always meant to, as he’s as good a storyteller in person as you say he is on the page! I think it is magic..and grace. There is just a special buoyancy to King’s writing that is hard to describe. I can still see that church disappearing as Monroe painted it away.